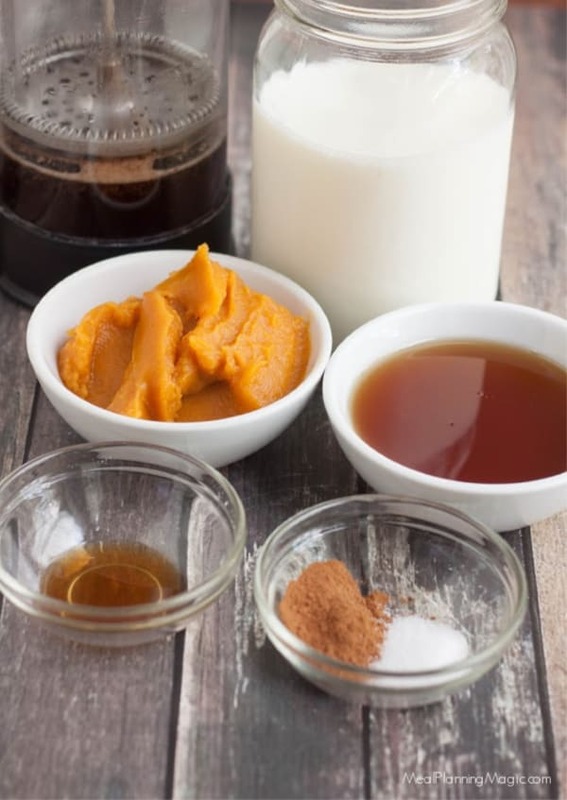 My Homemade All-Natural Pumpkin Spice Latte Creamer is just that—made from all natural-ingredients and perfect to enjoy anytime! Best of all, it can be made ahead and even frozen too! My Homemade All-Natural Pumpkin Spice Latte Creamer is just that-made from all natural-ingredients and perfect to enjoy anytime! Best of all, it can be made ahead and even frozen too! Are you on team PSL or not? Well, I sure am and that’s why I just had to create a recipe for Homemade All-Natural Pumpkin Spice Latte Creamer! I’m a big fall of all things pumpkin spice but I do try to wait until the “appropriate” season (aka October). I love pumpkin so much that I created a whole board on Pinterest called Pumpkin Palooza (<– check it out by clicking on the board name). 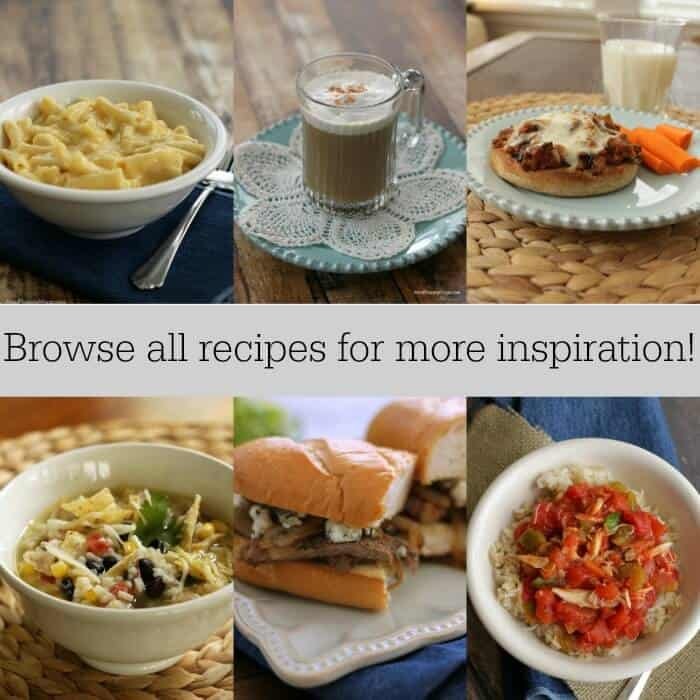 When thinking about this recipe I wanted to make it from all-natural ingredients. No artificial ingredients here! And since I really love the flavors of maple and pumpkin together, I knew I wanted to use maple syrup as my sweetener. 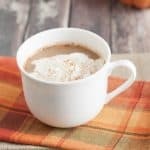 This Pumpkin Spice Latte Creamer is easy to make and best of all you can make it ahead and keep on hand in the refrigerator to enjoy with your daily coffee. Take it one step further and freeze the creamer in silicone muffin cups so that you can have it on hand any time! I love making homemade coffee creamer ahead of time because it allows me to enjoy a beverage that I know is not full of junk ingredients and that I don’t need to drag out all the ingredients every time. 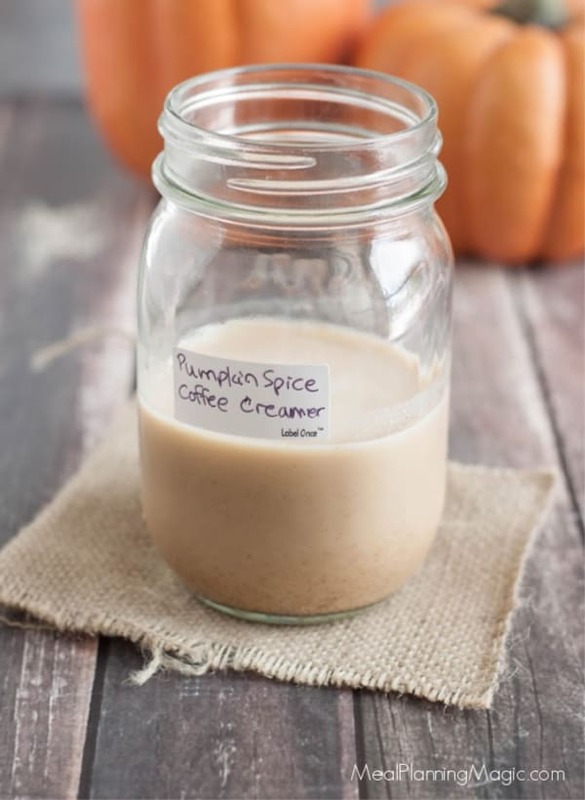 This All-Natural Pumpkin Spice Latte Creamer makes enough for fourteen or so 16 ounce lattes (depending on how much creamer you like in your coffee). One thing to note is that because this is made with real pumpkin, you may discover that your latte is a little thicker than what you might be used to. Because the pumpkin can sometimes settle to the bottom of the mug, I like to swirl the drink before each sip. I also like to think of it more akin to a cup of thick hot cocoa. Just giving you all a heads up on the mouth feel of this latte since it may surprise you otherwise! 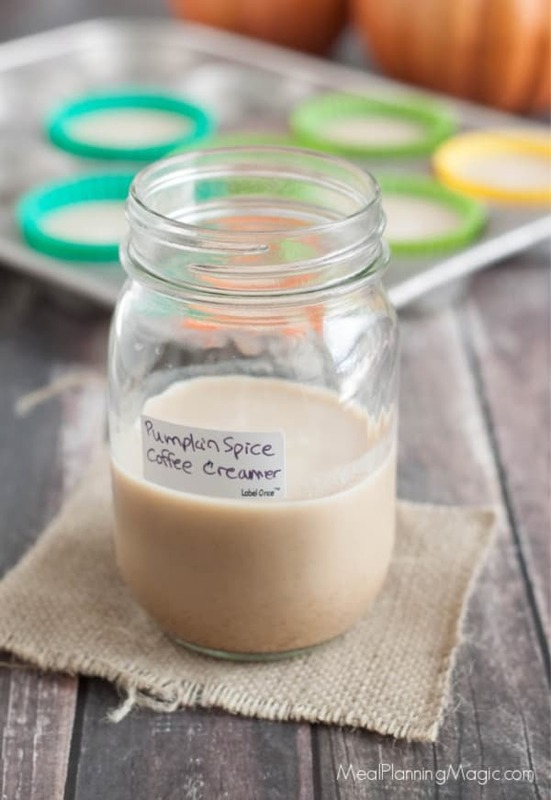 Freezing extra Pumpkin Spice Latte Creamer is so easy! I use muffin tins lined with silicone muffin cups. From there, I pour 4 ounces of creamer per cup. Then I place it in a flat place in my freezer until the creamer is firm. From there, I pop out the frozen creamer into a labeled ziptop bag and immediately put it back into the freezer. Then, when I’m ready to use it, I warm it up a bit in the microwave before adding my brewed coffee. I like to use a two to one ratio of 12 ounces of coffee to four ounces of creamer but if you like things a little lighter on the creamer side, you can reduce the amount of creamer to 2 ounces per 12 ounces of coffee. Of course, you can make your own combinations, those are just two that I like! Stir to combine, add a little whip cream and cinnamon on top if you like and voila! 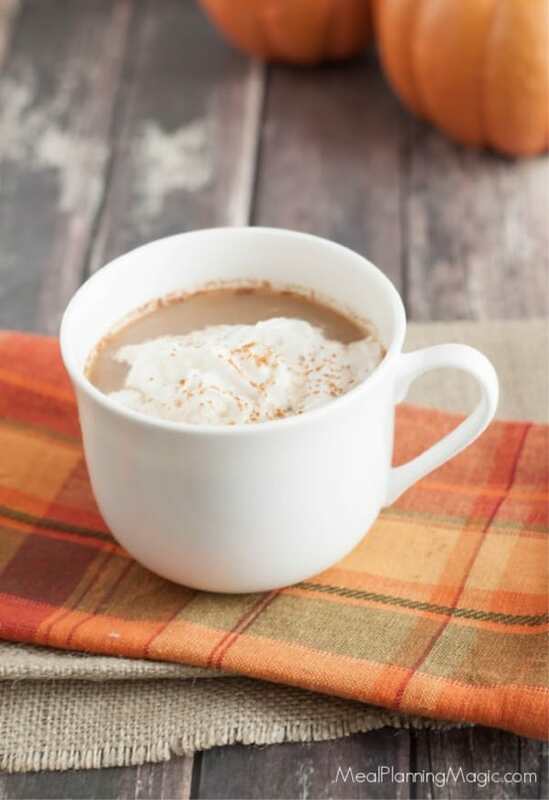 you have a Pumpkin Spice Latte made at home from all-natural ingredients! 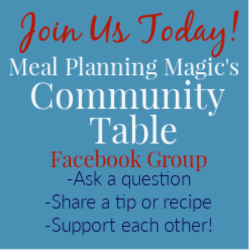 « 2018 Holiday Meal Planning Challenge – Sign Up Today! 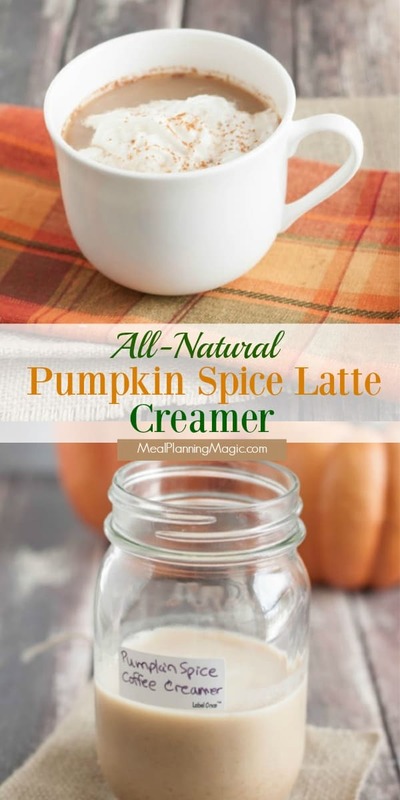 I would love to make this ALL-NATURAL PUMPKIN SPICE LATTE CREAMER but I don’t see a recipe for it. Where do I go to get the recipe or isn’t there one?? Whoops! I’m not sure why the recipe didn’t insert into the post correctly. I have made the update and you should be able to view it now. I hope you enjoy it!